Mix together the graham cracker crumbs and melted butter together until combined. Line 2 cupcake pans with 24 paper liners. Place a tablespoon of the graham cracker mixture into each wrapper and press to evenly cover the bottom of the wrapper. Set aside. In the bowl of a stand mixer combine the sugar, flour, cocoa powder, baking powder, baking soda and salt. Once the mixture is combined add the eggs, buttermilk, melted butter and vanilla extract. Beat the mixture on medium speed for 2 minutes. Carefully stir in the hot coffee until well combined. The batter will be extremely liquidy. Pour the batter evenly between the 24 paper liners over the pressed graham cracker mixture. 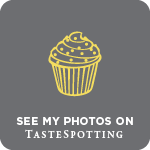 Bake on the middle rack of an oven for 18-22 minutes or until a toothpick inserted into the center of a cupcake comes out with no batter on it. Completely cool cupcakes on a wire rack before filling and topping. Line a baking sheet or firm cutting board narrow enough to fit in your fridge with wax or parchment paper. Set aside. Using a cupcake corer, apple corer, or knife create a large cavity in the center of each cupcake. Reserve the top of the removed cupcake piece. Fill the cavity with 1-2 tablespoons of Marshmallow Fluff. If the Fluff is too thick to handle, whip it with some heavy cream, a couple tablespoons at a time until it reaches the desired consistency. Place the top of the removed cupcake piece on top of the Fluff filling to seal the cupcake back up. Place the cupcakes in the fridge to chill. While the cupcakes are in the fridge melt the chocolate chips in a double boiler over medium heat. Once melted remove from the heat and stir in the vegetable oil until smooth. Dip half of each marshmallow in the chocolate and place on the prepared baking sheet or cutting board. Sprinkle the dipped marshmallows with graham cracker crumbs before the chocolate sets. Place in the fridge to harden. Remove the cupcakes from the fridge and carefully dip the top of each cupcake in the chocolate ganache to coat it. 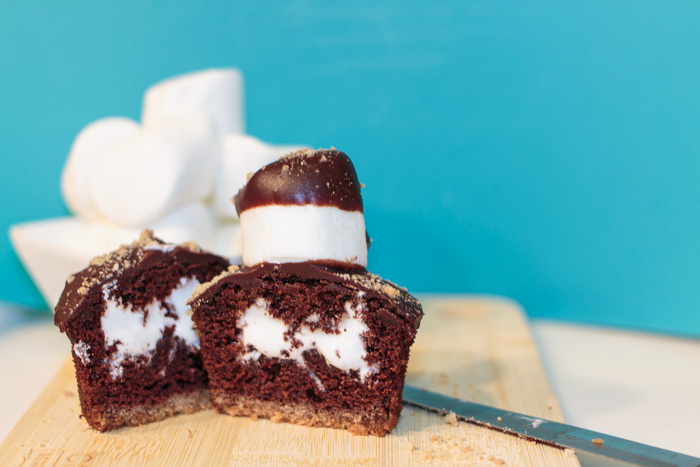 Place a chocolate dipped marshmallow on each cupcakes before the ganache sets. Sprinkle with the remaining graham cracker crumbs, place it in the fridge for the ganache to harden. Sometimes I find myself craving a sandwich. There’s something so satisfying about a fresh deli sandwich loaded with meat, cheese, lettuce, tomatoes and of course mayonnaise. Recently, to conquer my craving I decided to take it one step further and make a panini. While still a sandwich, a panini takes it to a whole new level with a crunchy exterior and gooey melted cheese. 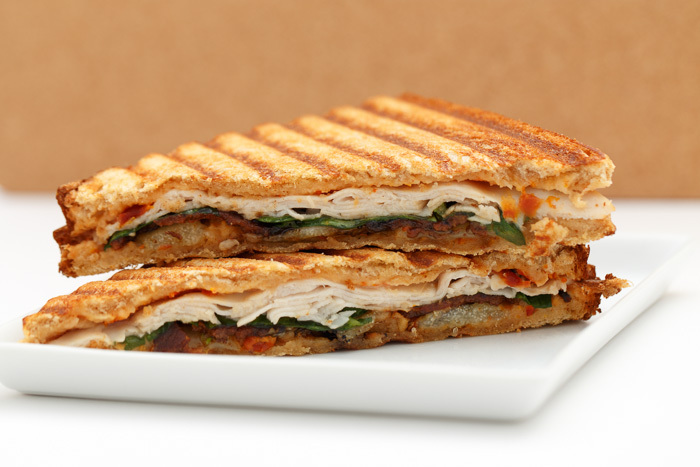 The panini is the queen diva of sandwiches and this one certainly stands up with the best of them. There are many stars of this panini and one is the Manchego cheese. Manchego is a firm Spanish cheese that tastes similar to monterey jack with an added nutty flavor. 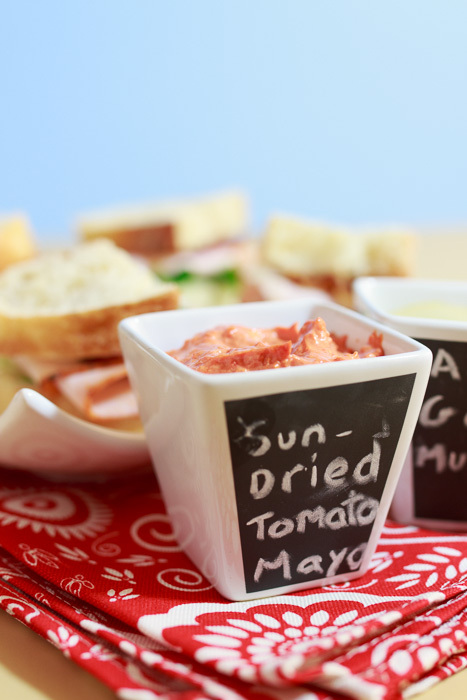 It complements the roast turkey, salty crunchy bacon and the delicious sun-dried tomato mayo. I don’t have a fancy panini contraption and it was still a cinch to make. All you need is a grill pan and another heavy pan to press the sandwich. If you don’t have a grill pan a regular frying pan will do the trick as well. 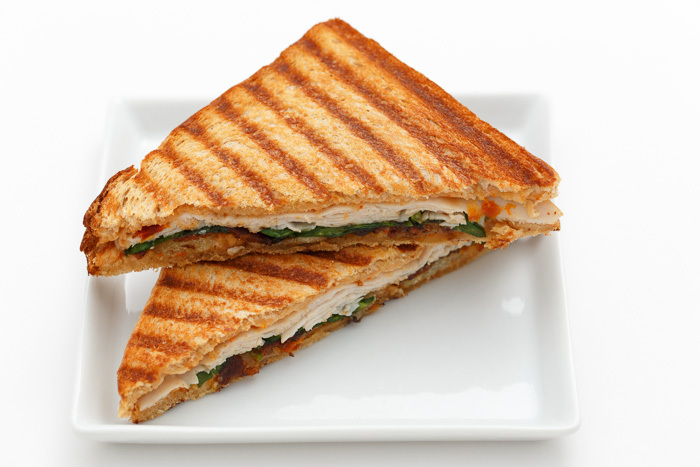 Now please excuse me while I make another one and continue conquering my craving, which is now for this panini. Heat a grill pan or skillet to medium heat and lightly coat with olive oil cooking spray, or heat 2 teaspoons olive oil. Make your sandwich by spreading 1 tablespoon of sun-dried tomato on each slice of bread. 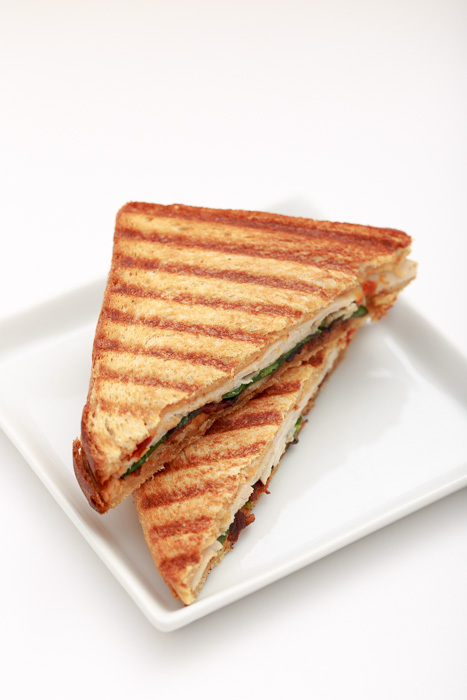 Add the turkey slices, Manchego cheese, bacon and spinach then close your sandwich. Place your sandwich on the grill pan or skillet and place a heavy pan on top of the sandwich to weigh it down. Cook the panini 3-4 minutes per side or until the bread is crispy and the cheese is melted. I’m unsure of what reactions I’m going to get about the following confession. I love mayonnaise. Love it with a capital L. I think it tastes fantastic on a wide variety of foods and, this is usually where people draw the line, I could eat it with a spoon. I’m hoping there’s at least a few fellow mayonnaise lovers out there! Well don’t worry, even if you aren’t as condiment obsessed as I am this sun-dried tomato mayonnaise is still sure to knock your socks off. It is so simple, but really brings something special to your sandwiches, paninis or other mayonnaise needs. I’m picturing this mixed in with some rotini pasta and crunchy veggies for a tasty twist on macaroni salad- yum! One way I consume mayonnaise if I’m feeling naughty is dipping my french fries in it. 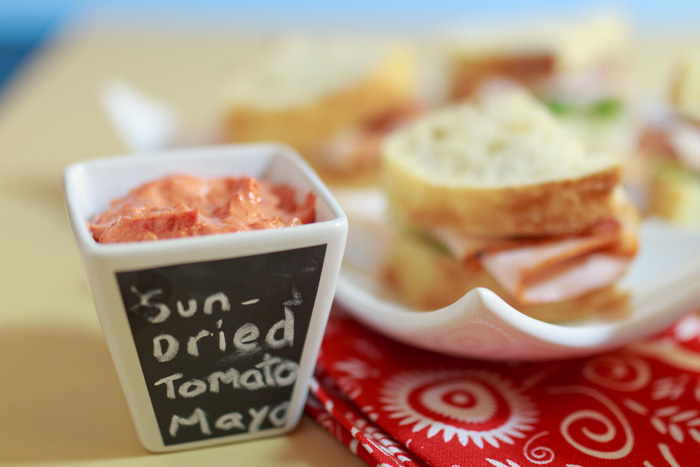 This sun-dried tomato mayo would be especially good for fry dipping with the acidity and tomato flavor being reminiscent of ketchup. This delicious habit I got from my mom, who got it from living in the Netherlands for a few years. The Dutch are truly on to something. When I was 12 my dad, brother, grandma and I went to the Netherlands and it was true, they dipped their fries in mayo. These were my people! Then I opened the mayonnaise packet and to my surprise it was pea green. Pea green mayonnaise? Twelve year-old me was concerned, but mayo-lover me decided to go for it. The verdict? Pea green mayo tasted just as delightful. So if you haven’t tried dipping your fries in mayonnaise before, make this sun-dried tomato mayo, eat some with your french fries and thank me later. Soak the sun-dried tomatoes in ⅔ cup hot water until softened, about 5 minutes. Drain. Place the softened sun-dried tomatoes, mayonnaise, lemon juice, garlic and sugar in a food processor. Pulse until well blended. Season with freshly ground pepper to taste.